The Isle of Wight Photographer of the Year (IWPOY) will soon launch its 2015 Awards, and in a brand new section they will also be looking for the very best female photographer from the Isle of Wight. Do you have what it takes to capture a prize-winning image? 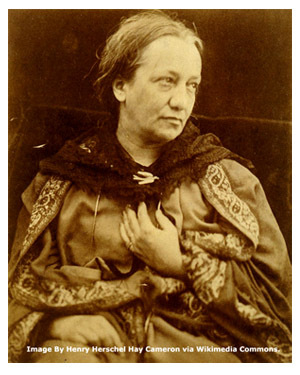 IWPOY are looking for inspiring photographers whose winning photos will take pride of place in an exclusive exhibition to mark the bicentenary of Julia Margaret Cameron’s birthday. 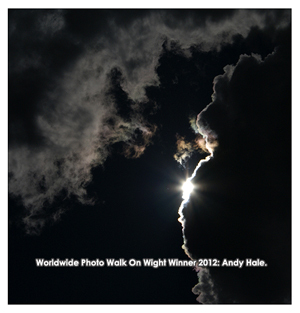 Andy Hale Wins Isle of Wight Worldwide Photo Walk Competition 2012. We are pleased to announce the winner for the 2nd Isle of Wight Worldwide Photo Walk in Carisbrooke, on Saturday 13th October 2012. The winning image (featured right)was taken by Andy Hale of East Cowes. We will be viewing all of the photos during a special evening later this month. Thank you to everyone that participated on the Worldwide Photo Walk 2012, you can view more photos on the main Worldwide Photo Walk website. 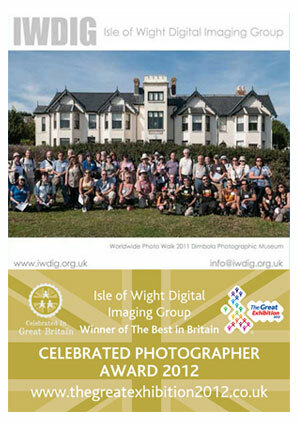 The Isle of Wight Digital Imaging Group has put the Isle of Wight on the Great British Map by winning the Best in Britain Celebrated Photographer Award 2012. 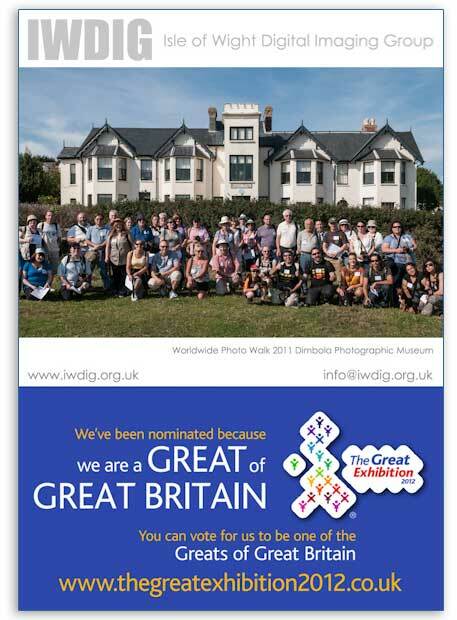 IWDIG Photographers were nominated last year for the Great Exhibition Awards 2012, as part of a nationwide competition to highlight the country’s best. The Isle of Wight won (Region) Best In Britain Resort and Bestival won (Unsung) Best In Britain Community Activity in the South East. The IWDIG est 2004, meet every Wednesday at Dimbola Lodge the former home of renowned Victorian Photographer Julia Margaret Cameron in Freshwater. 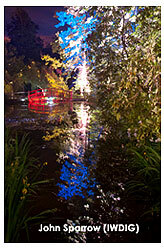 Regular visitors will remember: Island photography club members were invited to view – for free – the “Electric Woods – Blazing June”, at Robin Hill. Congratulations to Isle of Wight Digital Imaging Group photographers Verena Sparrow, Chris Cornford and John Sparrow who scooped three out of four categories in the Electric Woods Photography Competition. John also took the title of Overall Winner! and all winning participants are to receive their images on canvas. Read the story so far… IWDIG Photographers In Frame For Great Exhibition 2012 and Isle of Wight Photographers In Best of Great Britain Awards.